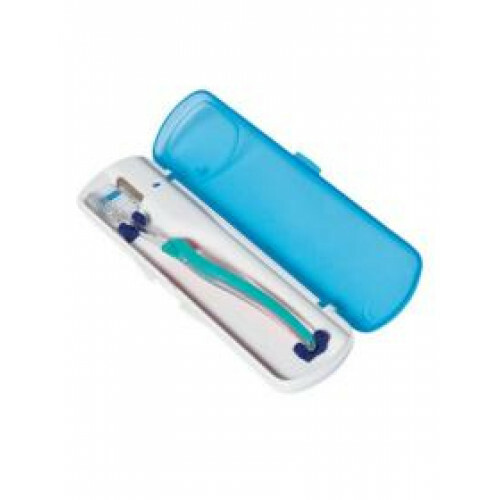 The CleanWave® UV-C Portable Toothbrush Sanitizer is the safe and easy way to sanitize your toothbrush. Germs and bacteria thrive in the moist environment of a toothbrush, and live long after you are finished brushing and rinsing your toothbrush. The powerful UV-C light safely eliminates viruses, bacteria and germs from your toothbrush. The automatic 6-minute sanitizing cycle begins the moment you place your toothbrush in the sanitizer after brushing. When it’s time to brush your teeth again, your toothbrush will have been sanitized. The sturdy case is perfect for traveling and keeps your toothbrush sanitized and germ-free.